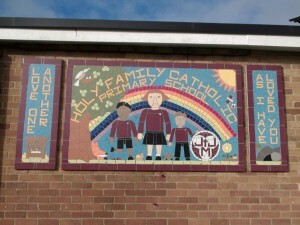 A school mosaic project is fun, inclusive and develops skills for all involved. 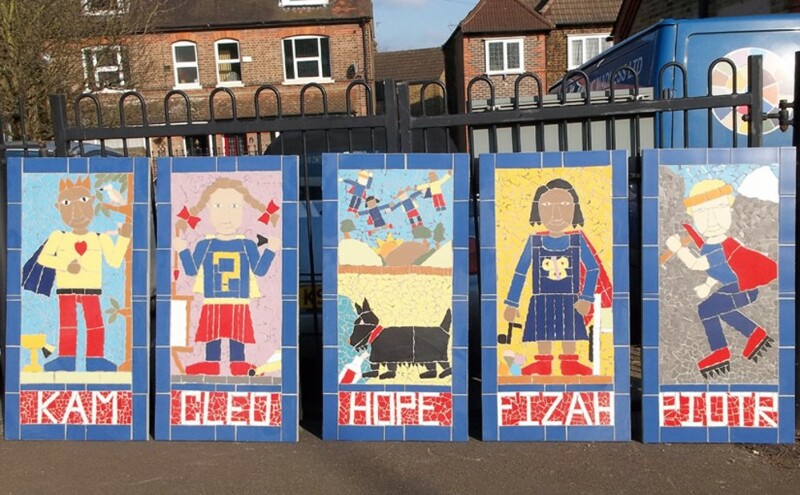 And, unlike some other art forms, a mosaic project produces a lasting end result – a mural or sign that enhances the school or local environment and gets the message across in a beautiful way! For more outcomes please see benefits of mosaics. You may wish to mark an event or anniversary, celebrate a new building or facilities, or just bring children together to create something beautiful. There are many examples in the gallery. I can also advise on links to curriculum, and have worked with hundreds of schools and had great feedback. Please contact me with any questions or to request a proposal. I have worked with children from pre-school age through to sixth form. Mosaics are truly accessible, and my experience includes children with additional needs. The different stages of the project allow for different individuals and groups to be involved and to shine. I ask for each school to allocate me a TA (or parent volunteer) to help in the running of the project, which also teaches them the basics of mosaics for future projects. I can also run small staff workshops if required, as an added extra for team building or relaxation after school! Learning – each of the school subjects is depicted by an image, such a computer for ICT, etc. Values – each value is depicted by an image (see School values). Outside and play – imagery to show the playground and green areas. Nature – animals, birds, flowers, trees, weather etc. Healthy Eating, using the idea of “from field to fork”, and depicting the 5 food groups. Religious themes, such as a faith tree, cross or crucifix (see Faith schools). Community and World, looking at the local community and further afield. Stories such as from a children book. Memorials to children or staff. Celebrations & Anniversaries, generally this is for a new building or 10th, 50th, 100th of the school.